I have a convoluted history with Russian Circles. Well, not really convoluted per se.... see, once, early in my current relationship, i took my girlfriend out to see a band i liked. That band was Russian Circles, who played the EARL with some other metal bands. The girlfriend in question is a Deadhead, so when the first band started thrashing along to black metal growled vocals, she kind of lost it. I still, to this day, hear about how awful that show was for her. And she uses "like Russian Circles" as a sort of shorthand for things that i like that she does not understand. 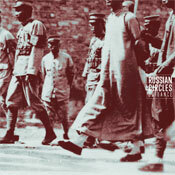 And Guidance, the sixth album in ten years by Russian Circles, falls completely within that realm. But it shouldn't. You see, Russian Circles consider themselves a metal band, but they qualify that with the term "instrumental" and sometimes people take that to dub them "post-metal". They are a band that owes as much debt to Mogwai as to Sabbath, who take as much influence from Slint as from Slayer. There is intense riffage -- at times -- but also soaring beautiful melodies and a depth of tempo changes and mood dynamics that gets a good bit deeper than your stereotypical metal song. Honestly, the album that Guidance reminds me of the most is The Wilderness by Explosions in the Sky. There is a real similarity in flow between the two records, between the way that the two bands play with changes in pace and depth of sound. Take the opening two songs of Guidance: Asa and Vorel. The album starts with a guitar tinkling along slowly, the rhythm light and meandering. For four minutes this haze sort of wanders around as, slowly, the drums gather force. They explode, and suddenly we are in Vorel, Dave Turncrantz playing a rolling drum riff that is all over the kit, roaring like thunder in the distance, while guitarist Mike Sullivan chugs along with power chords and bassist Brian Cook thumps away angrily. In a way this is really one song with a long, meandering intro before the heavy riffing starts. It lets you chill out before head-banging. After the fury of Vorel parts, the guitar tinkles as Mota kicks off, a song similar to Vorel with its propulsive rhythm and guitar riffing. Afrika starts off with a tinkling guitar part which i bet pisses Explosions in the Sky off since they didn't think of it first, a really lovely trill as the rhythm slowly builds. Afrika features a rare drum solo, as the guitar and bass part in the middle of the song for a second to allow Turncrantz to just pound the heck out of his kit. It's really intense and nicely done. Those last two songs were pretty metal-ish, i will admit, but Overboard abandons any pretense of metal. This is a slight post-rock tune, almost ambient, the band wandering slowly for five and a half minutes. Calla kicks off with a fuzzy guitar riff that reminds me of McClusky, a riff that alternates with some intense riffing. In the middle, the band is hammering at with chugging guitar riffs, a real head-banging moment, the intensity, moderate place, and bass heaviness of which reminds me of Sleep. Lisboa brings the record to a close with another great post-rock tune, the whole band slowing down, speeding up, allowing quiet to build tension before hitting you with heavy riffing. I like this record. I like what Russian Circles are doing, the way that they take the traditional heavy riffing and solo-ing of metal and add in the sonic dynamics of post-rock. But let's face it: if that intense heavy metal riffing is not your thing, then Russian Circles have nothing to offer you. My girlfriend is not going to be persuaded to put down her Grateful Dead CDs because of anything on this record. But if, like me, you need let your inner headbanger out every once in a while, then this is a nice, rifftastic loud album that begs to be head banged to.